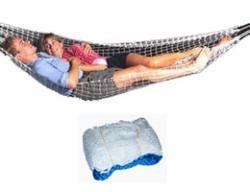 Lightweight and Portable Double hammock is the largest, strongest, and most comfortable portable hammock we make. It has a Double Sized Bed and is 50"' wide and enough for two people. It is constructed with the toughest Nylon made. 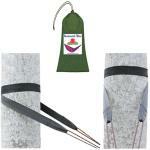 Portable and Compact you can take this hammock along on almost any outing. This hammock is comfortable, yet rugged and durable enough for Camping, at the Cottage or Cabin, or in the comforts of your own Backyard. Use with or without a sleeping bag. It can also be used for above-ground Camp Storage or Emergency Stretcher. Maybe washed in cold water with mild detergent. The next time you want a multi-purpose hammock that will last for years think "SWEET DREAMS". "Your delivery arrived earlier then the quoted time and any expectations I had. Thanks!"